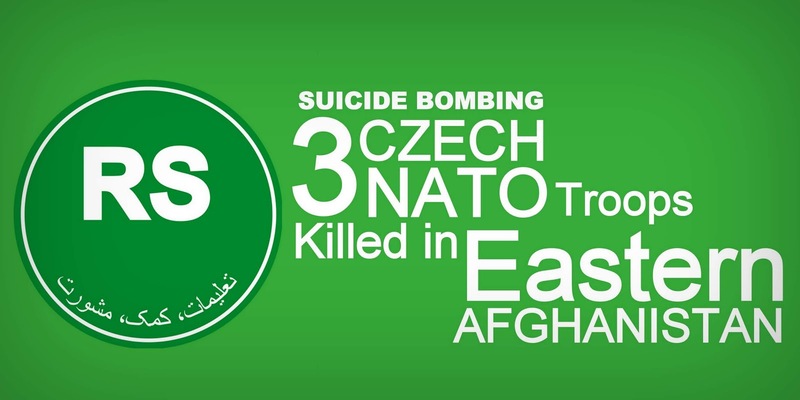 On August 5, 2018, Three Czech members of NATO's Resolute Support Mission (or Operation Resolute Support) were killed in a suicide bombing at Charikar, the capital of Parwan province, at 6:00 local time (01:30 GMT) in eastern Afghanistan. The troops were targeted while executing a routine foot patrol in the larger perimeter around the Bagram military base - about five miles from the site of the attack. A U.S. soldier and two Afghan troops were also wounded in the blast, the statement added. Taliban militants claimed they carried out the attack, NATO officials said in a statement. In a Twitter post, Czech Prime Minister Andrej Babis hailed the three soldiers killed as "heroes" and sent his condolences to their families. U.S. Army General John William Nicholson Jr., commander of Resolute Support and U.S. Forces-Afghanistan, said in a statement, "Their sacrifice will endure in both our hearts and history and further strengthen our resolve." The US-led NATO force, which comprises of soldiers from 41 countries, pulled out most of its troops after it ended its combat mission in Afghanistan in 2014. However, 16,000 service members remain for providing support and training to the Afghan National Army (ANA) and carrying out counterterrorism missions. Recently, the Czech government has approved a plan to deploy 390 troops in Afghanistan through 2020, up from the current 230, as part of the NATO-led Resolute Support Mission. In the eastern province of Nangarhar, officials said on August 5 that a suicide bomber killed an Afghan soldier in the provincial capital, Jalalabad. The incident occurred roughly at 6:45 p.m. local time near a security checkpoint at a square in Pul-e-Behsood neighborhood, after an army soldier identified and intercepted a suicide bomber approaching the busy area. Three security personnel and one civilian were also injured in the attack, said Attahullah Khogyani, spokesman for Nangarhar's governor. No one immediately claimed responsibility, but both the Taliban and the Islamic States group are active in the province. Eastern Afghanistan remains one of the deadliest areas for the U.S. military since its main combat operation against the Taliban ended in 2014. Last month a U.S. soldier was killed and two others wounded in an "apparent insider attack" in southern Afghanistan, NATO said. The shooting happened at the airport in Tarinkot, the capital of Uruzgan province. Meanwhile, hundreds of mourners have buried the victims of a twin suicide attack on a Shi'ite mosque in eastern Afghanistan, as the death toll rose to 35, officials said. Two suicide bombers entered "Khwaja Hassan" Shi'ite mosque wearing full-face veils at about 13:30 local time (09:30 GMT) in Gardez, capital of Paktia Province, on August 3 as it was crowded with worshippers for weekly prayers. They then opened fire on the worshippers, before one of the men was shot dead by security forces and the other one blew himself in the "worshipping" chamber. The Taliban has denied any involvement in the attack.